Greetings from the LA Wine Festival where I’m pouring our 2007 Butterdragon Hill and 2007 Baconbrook. We’ve participated for years to benefit the Children’s Tumor Foundation. I usually send the wine down and volunteers from CTF pour while spreading information about the fight against these genetic disorders that affect so many children. This time, I get to work alongside the CTF crew. It seems like a great time to share the video below of our niece, Rose Match Suna. She was the 2010 Ambassador for CTF and we’re very proud of her. Today was the Barrel Auction portion of Auction Napa Valley, the Napa Vintners’ humungous fund raiser for Napa Valley charities. For those who don’t know how it works, 100 vintners bring in barrels of future releases and offer samples to attendees. Bidders place bids for a case of the future release. The top 10 bids win. Bids for cases of the big names rise up to the stratosphere but one can pick up some great deals on under-the-radar wines. For example, bidder #10 on our wine picked up a case of our 2009 Butterdragon Hill for just $275! Our winemaker, Cary Gott, was on hand to give me a break so I could try some other wines. My overall impression was that the (mostly 2009 vintage) Cabs on display were more tannic and exhibited more structure than the 2008s we tried last year. However, the tannins were smooth and elegant. At least for some wines, it could be a long lived vintage. It seems to be a year in which conservatism was rewarded with more sophisticated, structured wines while those that went for a more modern, ripe style tended to end up with more nondescript wines. The complexity in their power that they were shooting for never materialized. In particular, I tried several wines from the famed ToKalon vineyard. While ripe, these wines in general exhibited a lot of fruit and little structure. Not to say that one won’t enjoy them. You might. But cellar aging and food pairing might be a challenge. As is my custom, the wines I mention are wines that are recommended to at least some degree. The number of asterisks indicates the strength of my recommendation. 2009 Crocker & Starr Cabernet Sauvignon – **** a pleasurable balancing act between a more classically styled Cabernet and modern. 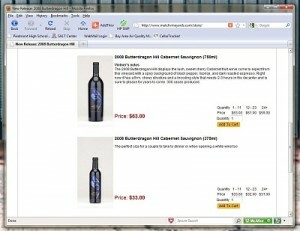 2010 Madonna Pinot Noir – ** a non Cabernet based wine is a rarity at the Napa Auction. This wine shows a lot more richness than their 2009 with a lovely, “cute” nose of fresh berries still in the berry patch. California style, but not over-the-top from this Los Carneros producer. 2009 Meander Cabernet Sauvignon Morisoli Vineyard – *** enticing mint aromas with flavors of plum, tea leaves, and notes of dill. If she can keep vineyard sources as good as this, Amy Aiken (daughter of Joel Aiken of BV fame) is one to watch with this winery. 2009 Merus – * Rich, bold attack but thins in middle and finish. Less tannins than some of the peers tasted today. 2009 Mi Sueno Cabernet Sauvignon – **** Sweet candy nose but sophisticated and elegant in the mouth. Smooth, well integrated tanins and a surprising mint finish. I’m a big fan of this winery. 2010 Oakville Terraces Cabernet Sauvignon – **** Perhaps the most exotic wine of the day. They’re cheating a bit showing something fromt the awesome 2010 vintage. Fresh and young as expected but has alluring undertones of licorice, eucalyptus, and road tar. My surprise discovery. 2009 Oberon Cabernet Sauvignon Hillside Reserve, Three Elevations – ** Backward, but balanced. Dry, dusty finish. The jury is out on this one. 2009 O’Shaughnessy Cabernet Sauvignon – nice enough, but their 2008 which was my highlight from last year was much better. 2009 Paraduxx Blend Coferment– I got a long spiel on how they ferment some Viognier with this wine. The wine was okay, but I didn’t perceive any special element. 2008 Promise Cabernet Sauvignon – ** Nicely integrated but shows its 3 years in new oak. Necessary? Probably not. 2009 Raymond Cabernet Sauvignon – *** a special blend of the auction but basically their Generations blend, I liked this wine a lot. Now this is a great idea! I just heard about Napa Valley Designated Drivers. They will provide you with a designated driver for your own or rental car so that your entire group can do a few hours of wine tasting safely. It looks like they charge about $50 an hour which is less expensive than hiring a car and driver, taxi, and much less expensive than a DUI. I’ve never used this service nor do I know anyone who has, but they have good feedback on Facebook and Yelp. Today only… Enter the coupon code 1300902170 when checking out of our online store for an additional 30% off all of our 2004 and 2005 vintage wines in stock. Do you remember your login and password? This offer is only good for orders placed before midnight pacific on Friday 5/6/11. Sorry, no extensions. in his own non-traditional way. Match Vineyards will be there too! We’ll be sampling and auctioning off 10 cases of 2009 Butterdragon Hill at the Auction Napa Valley Barrel Auction on June 3rd. A documentary made by Joe Wagner (Caymus), Joel Gott (Joel Gott Wines), and Dave Phinney (Orin Swift) about making a special wine blend to benefit their kids’ school. The documentary is fake. I had a chance to do a side-by-side tasting comparison of these two wines this past week. The 2008 Butterdragon is fairly closed right now and needs hours of air to start to show its stuff. I recorked a bottle and a couple of days later it was much more expressive. The ’08 vintage, in my opinion, is going to display more depth than the ’07, but it is going to take some time. My recommendation right now is to hold your 2008 Butterdragons for a few years. Surprisingly for this vineyard, the 2007 Baconbrook was more open for business. After just an hour of air, it’s really singing with a great, complex finish. While cellar age is still the watchword with Baconbrook, you can enjoy the 2007 now with a bit of advance planning. I’m going to try to regularly update drinkability reports in this Vintner’s Journal. That’s right… we’ve finally released the 2008 Butterdragon Cab. And with it, comes the debut of our online store. During this release period, we’re donating $1 from every bottle sold to Japanese earthquake/tsunami relief efforts. If you have not received your email release letter, it means we either don’t have a working email address on file OR you never signed up for our mailing list. Either way, that can be fixed. One Wednesday, January 19, 2011 we bottled approximately 150 cases of our ’08 Baconbrook Cabernet. This wine will be released in the Fall. Here’s the video. Sorry for some of the sound quality. It’s loud on those bottling trucks.